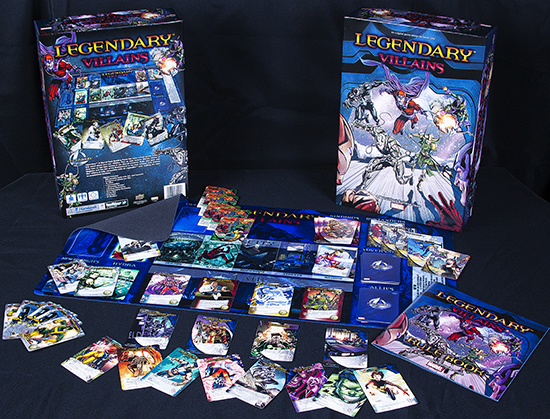 Evil Wins with Upper Deck's Latest Expansion for Legendary! Gamers declared Legendary: A Marvel Deck Building Game a hit when they played as Marvel Super Heroes trying to save the day, but things are about to change. Upper Deck will be releasing the fourth series expansion, rightfully named Villains, which will flip gameplay upside down and allow fans to play as the evil Marvel villains. All of a sudden, being bad never felt so good! The Villains core set expansion will include 550 playable cards featuring incredible original artwork. For the first time ever, fans can play as Marvel villains and attempt take out the Super Heroes who are challenged to protect the city. New for this set are 15 playable allies, seven adversary groups, four commanders, four back-up adversaries and eight new plots! Additionally, gamers will be able to use new Hydra-themed starting hands along with new bystanders! The game will feature an assortment of Marvel’s greatest villains including Magneto, Venom and Dr. Octopus as they battle some of the most heroic characters in the Marvel Universe. With subtle changes to the game board and game play, the Villains core set provides fans with a whole new playable experience and rubberized play mat with a long-lasting and transportable board to battle on. Play with or against friends in this evil new deck-building game from Upper Deck which will release in early July!